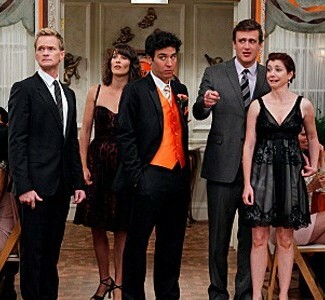 How I Met Your Mother: "No Questions Asked"
Quick Review: A silly episode that comes together nicely at the end. Spoilers ahead, so don't continue forward if you haven't seen the episode. Of course, whether you proceed forward is entirely up to you. I'm not the boss of you. I'm just here to offer some friendly advice and then step back so you can make your own decisions. I won't judge you, no matter where your choices take you. Even if it means dressing in a blue leotard, because if that's what you have to do, I'm behind you. I just won't be under you, because I probably lack the upper-body strength to catch you if you fall, and that's not the time you want to find out. How I Met Your Mother: "Knight Vision"
Spoiler alert, so you'll probably want to see the episode before taking the dangerous journey below. You never know what you might face. You might have decapitating blades, perilous drops, and an invisible bridge. That's not something you want to face unprepared, even if James Bond is your father and you shot first. Of course, I can't stop you. You are free to make your choice. How I Met Your Mother: "The Poker Game"
Quick Review: A good episode, it misses a perfect opportunity to be great. Spoilers ahead, so think twice before proceeding. Unless you've seen the episode. If you've seen the episode, then there's no real reason for you to not proceed. It's not like there's something holding you back. You should feel free to continue onward and read this review. Don't worry if you have to be at the gym for the second time today. The gym will still be there when you're done reading. Granted, this review should be here if you choose to go to the gym first, but can you really take that chance? I wouldn't. How I Met Your Mother: "The Broken Code"
Quick Review: This series is always at its best when exploring the relationships between the characters, and this week's episode was no exception. Spoiler alert. Yes, there are spoilers. I would be in violation of the code of the internet if I didn't warn you about spoilers. I'm courteous like that, a big believer in Netiquette. That's why I also don't type in ALL CAPS, because that's another violation. If you're not careful those quickly add up, and then the Elders of the Internet show up at your house. To avoid that happening, please consult the code of the internet, which can be found in many hotels next to the Gideon Bible. How I Met Your Mother: "Last time in New York"
Quick Review: Deuling, Zombies, The Princess Bride, Mandy Patinkin, True Love...and yes, this is a kissing episode. Spoilers ahead, so be warned. The last thing you want to do is spoil yourself before getting into this fine episode. Who lives, who dies, you will be shocked when you find out? Ok, no one dies this episode. That could be considered a spoiler, though, which is why I recommend you stop reading right now. Otherwise you'll feel terrible, like a Vikings fan forced to wear a cheese hat.